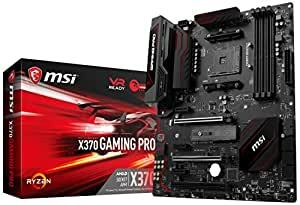 MSI X370 GAMING PRO motherboard supports AMD RYZEN series processors and 7th Gen A-series/Athlon Processors for socket AM4, DDR4-3200+(OC) memory, providing best virtual reality game experience without latency. Outsmart and outperform your opponents in-game using an array of unique MSI GAMING tools. Clever hardware and software tools, created to keep you one step ahead of the competition and boost your skills.